Do I need to start at a beginners level? This depends on your own level of fitness & what you want to gain from the sessions. Ideally every client will start with a beginners class, however if you are currently training in another fitness ares (eg: running with an athletic club, or a member in a gym) and have a reasonable level of fitness & understanding of anatomy then you can start on a higher level class. Is Pilates suitable for a client with a back problem? Yes, Pilates is very beneficial in reducing pain caused by muscular & skeletal issues. Most physiotherapists, Chiropractors’ & G.P’s recommend it. A beginners level class is suitable for most clients with a back problem however, if you are unsure, please contact us to discuss your specific issue & we can advise further. I have just had a baby when can I start post natal Pilates? The recommendation for Pilates is minimum 6 weeks post birth for a normal delivery. Post caesarean section we recommend 8 weeks, however every person is different & every birth is different. New mums need to take time to recover after having a baby & not feel rushed in returning to exercise or pressured into regaining the ‘pre pregnancy figure’. Courses don’t work for me as I work shifts, how else can I organise my training with you ? We run drop in classes 3 mornings a week (one Saturday) these are a level 2-3 class & don’t require any sign up or pre booking. If basic principles need to be taught & a postural assessment made, then a single one to one session can be scheduled at a time convenient for the client. How is reformer Pilates different from mat Pilates? Firstly, our reformer Pilates is more of a personal training session. We only take a maximum of 5 in a session therefore the training is much more specific to the client & more focus is on form & alignment. All our reformer clients receive an initial postural assessment & a one to one session before they start their reformer course. 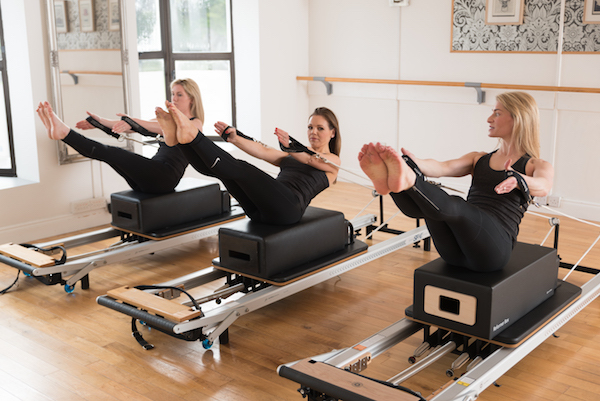 Reformer Pilates works with spring resistance which is extremely effective in creating muscle tone, increasing flexibility & stimulating bone growth. Programs are written specifically for the clients attending the session. I have osteoporosis, can I attend a Pilates class? Yes, our over 55’s class is a flexion free class & is therefore safe for clients with both osteopenia & osteoporosis. Our studio owner, Lindsay teaches this class & is fully qualified in Osteoporosis management with STOTT Pilates. The over 55’s class program is also focused around building bone density by working with flexi bands for dynamic loading resistance, effective in stimulating bone growth as well as strengthening muscles, taking the weight away from the skeleton. I’ve just found out I’m pregnant, can I continue with my Pilates classes? Unfortunately our regular classes can not accommodate a pregnant client. Do you run a Mens Pilates class? We do not run a class specifically for men, however all of our classes are mixed and we have men training with us in most of our classes. Reformer sessions must be cancelled 48 hours before the session to receive a financial credit. Therefore if your session commences at 6pm Tuesday, you must cancel before 6pm on Sunday evening. This allows us time to offer the session to someone else & in turn gives them time to get back to us & for us to offer the place again if they are unavailable. Reformer sessions must be cancelled 24 hours before the session to receive a session credit. Therefore if your session commences at 6pm Tuesday, you must cancel before 6pm on Monday evening.We will endeavour to give you another session instead, but this depends on availability & other cancellations. The offer of the session may also be at short notice so we would ask for some flexibility regarding days & times.